I was born in East Hartford, CT where I lived until college. I credit my grandfather, a painter, for my love of painting and creativity. I studied art at the Rhode Island School of Design and later graduated from the University of South Carolina with a Bachelors of Fine Art in Art Education. My interest in mediums is almost as diverse as the subject matter of my works. I enjoy ceramics, photography, oil, acrylic, water color, pastel, pencil and printmaking. In some cases, I prefer to make specialty papers to add interest to particular prints. My work has been showcased in juried art exhibits as well as in local establishments. Check below to see where my work is currently on display or if I plan on being at an upcoming festival. 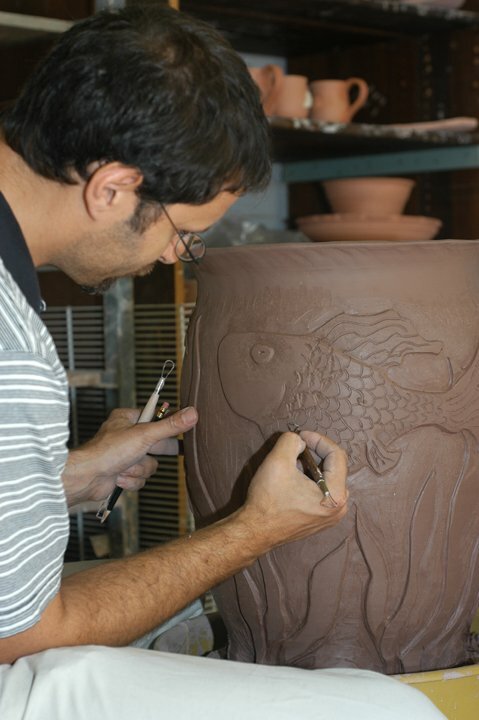 I’m a member of the Danville Art League and I also teach pottery classes at the Danville Museum of Fine Arts & History. Now living in Dry Fork with my wife and 3 daughters, I co-own and manage the Awards & Trophy Shop in Danville, VA with my wife Beverly who is also an artist. Check out her web site: White Oak Mountain Gourds and Fiber Art. Stop by and visit my gallery at the Awards & Trophy Shop in Danville, VA where my work is also on display and for sale.